Seems like only yesterday I was waxing nostalgic about Sensei Dave Williams while at the same time believing in my heart he'd be teaching Tuesdays and Thursdays forever. The fact is, there is no "forever". Dave and Anne are moving to Florida, and tonight — in just a few minutes — Dave will be teaching his last class at Oishi. I'll be there, sorely regretting that I didn't come more when I could. 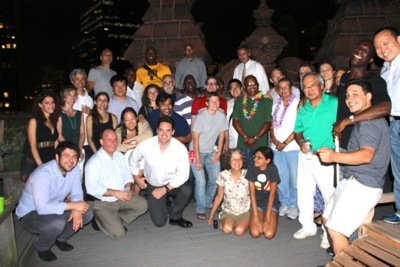 On July 11 Sensei Andy hosted a farewell party. Here's a Flickr set with some photos. If you're on Facebook, Thomi Lee posted some there as well. Please join me in wishing Dave and Anne the very best. Maybe take a moment to "look for Marius's friends" tonight. (If you've ever been a Tuesday/Thursday regular, you'll know what that means.) And remember, "Bikini weather's coming." This entry was posted on Tuesday, July 23rd, 2013 at 6:26 pm	and is filed under Dojo News, Photos. You can follow any responses to this entry through the RSS 2.0 feed. You can leave a response, or trackback from your own site.